Porsche, a global brand, consistently combines innovation and tradition. The company’s history spans more than 100 years and is shaped by passion and vision. The new Porsche museum is a place which expresses the company’s self-confident attitude and its high standards through architecture. Know-how, credibility and determination are as much part of the company’s philosophy as are courage, enthusiasm, strength and independence. Each idea is seen as a chance to offensively tackle new challenges and to push boundaries. The museum represents exactly this position of representing exclusivity without exclusion, of reflecting tradition without forgoing the vivid exchange which makes Porsche so unique. "The new Porsche museum represents our conception of architecture which is constantly moving in the field of interaction between buildings and their users." The central draft concept was the translation of the versatile and vivid brand into the language of architecture. The museum features those specific conditions which the Porsche brand conveys both spatially and sensually to visitors. Drive and speed, statics and logjams can be experienced both in the building’s configuration as well as through the spatial medium. The museum is an open, clearly defined place which incorporates all brand specific qualities. Here, speed and passion find their spatial equivalents and can be impressively retraced in the sensual experience. Experience and the opportunity to experience were the primary design parameters through respective spatial allocations in the basic architectural concept. The seeming dichotomy of the architectural shape is the appropriate answer to the building’s function and the exceptional position of its exhibits. 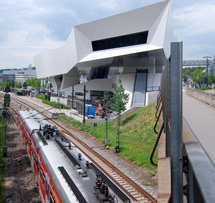 The museum’s conceptual design demonstrates our perception of buildings as interactive organisms, as communicating part of a whole. The consistent interaction between the building and its environment is conceived as a quality, as is a functional and practical utilisable space. The specific characteristics of the spatially definable environment are conceived as a landscape or urban landscape, its interpretation as the corporate approach.